Enjoy the acclaimed island of the Cyclades, and its outstanding beauty. Find tickets to Santorini from any destination including Athens (Piraeus), Heraklion, Mykonos and more using our search engine. Santorini is at the southernmost point of the Cyclades Islands complex. Due to its unique beauty, the island of Thira (the official name of the island in Greece) attracts a lot of travelers. And fortunately, this leads to frequent ferry connections with Athens, Heraklion and other islands. More particularly, the island is connected with Athens through the ports of Piraeus and Rafina. During winter there are one or two ferries per day between Piraeus and Santorini. On the other hand, during summer there are around ten (!!) ferries per day between Santorini and Athens (Piraeus and Rafina combined). The trip with the conventional ferries lasts around 7.30 hours, while with the high-speed ferries the trip time is reduced to 5 hours. The island is well connected to Heraklion (Crete), with two or three daily high-speed ferries, operated by SeaJets, Minoan Lines and Golden Star Ferries. The tickets for both companies cost around ~70€ and the trip lasts 1h and 45mins. You may check our Heraklion to Santorini page to learn more about the relevant ferry ticket prices, trip duration, and ferry companies. Another quite popular ferry route is the one connecting Santorini to Mykonos. During summer, there are nine ferries per day that serve this route. Even if most of these ferries are high-speed ones, some of them also have a car garage. Thus, you may choose these ferries to take your car with you. Check our Mykonos to Santorini page to find out more. 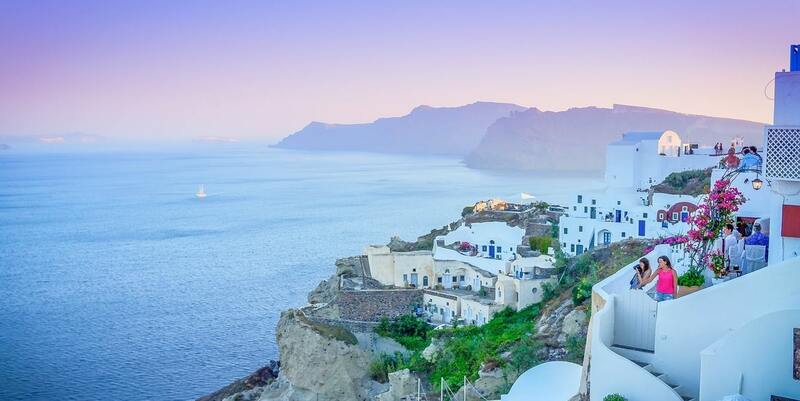 If you want to add Santorini in your island-hopping itinerary then you are quite lucky, as there are quite a lot of connections to other islands around. During the summer, there are quite a few ferries per day to Naxos, Paros, and Ios. There is also a ferry route operated by SeaJet2 of SeaJets, connecting Santorini to Amorgos and Koufonisia. How can I book my ferry tickets to Santorini? In Ferryhopper we specialize in providing you with all the available ferry itineraries. Showing you the best prices for your ferry tickets is of utmost importance to us. Here you can find the most up-to-date ferry schedules. Now, you are just a few clicks away from booking your tickets to Santorini using our ferry tickets engine! Santorini is world-renowned for its whitewashed villages, clinging on the sheer cliffs of the only inhabited caldera in the world. The main villages are located on the highest grounds, away from the vulnerable lowlands and coastline. They were strategically located on the edge of the caldera, at the top of the hills or within ravines. In the past, they offered maximum protection against the weather elements as well as the frequent enemy attacks. Numerous volcanic eruptions, that have been taking place over the past 1,5 million years in this part of the Aegean Sea formed the Caldera. During all these years, several different volcanic cones, calderas, lava flows, and deposits have created layers of colorful formations. Its Minoan eruption that dates back to 1650 B.C. is the most famous one, which resulted in the destruction of the advanced prehistoric civilization of Akrotiri. The force was such that it has also been connected to the destruction of the Minoan civilization in Crete, and has inspired the myth of the Lost Atlantis. Its shape has changed endless times in the course of the centuries. Vast lava formations have emerged from the bowels of the earth and gorges sculpted in deep pockets of pumice define the dramatic relief of the island. At the same time, terraced fields dominate the rest of the island, with various crops growing on the arid land. The unique Theran soil produces very few but utterly delicious products. Vines, fava beans, cherry tomatoes, barley, white eggplants, pistachio, and olive groves coexist peacefully in the volcanic, mineral-rich soil. Pay close attention to the arid land. Depending on the time of the year, you will notice fields and terraces covered with various crops. All these products had to be transferred to the seaports, nested within the safe waters of the caldera. The result of these centuries-old efforts to accommodate life on Santorini is an astonishing 19 hiking routes. The routes run across both the length and width of the island. And although there is little need for the paths as cars took over, they remain a testament to our heritage and a present to visitors keen on discovering it on foot. Walking tourism is becoming increasingly popular and Santorini is particularly suited to it. Once a person steps foot on one of the many cobbled or earth paths, they will quickly realize that this is the best way to explore and get to know the gem of the Aegean Sea. Whitewashed cave-houses, neoclassical mansions, terraced fields, blue-domed churches, Venetian Castles, and breathtaking cliffs are just a part of this postcard-perfect booming tourism destination. The rest remains to the eye of the beholder who will take a walk on the wild side in order to discover it.